Prominent & Leading Manufacturer from Vapi, we offer aceclofenac, celecoxib and nimesulide. 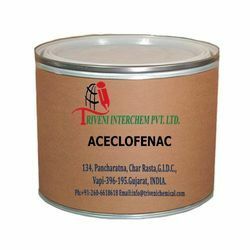 Aceclofenac (89796-99-6) is solid. it is use in analgesic, nonsteroidal anti-inflammatory, rheumatoid arthritis and ankylosing spondylitis Industry. Storage: Keep container tightly closed. Keep container in a cool, well-ventilated area. Waste Disposal: Waste must be disposed of in accordance with federal, state and local environmental control regulations. Celecoxib (169590-42-5) is solid. it is use in anti-inflammatory Industry. Storage: Keep container tightly closed. Keep container in a cool, well-ventilated area. Waste Disposal: Waste must be disposed of in accordance with federal, state and local environmental control regulations. Nimesulide (51803-78-2) is Solid. it is use in anti inflammatory drugs and nonsteroidal anti-inflammatory drugs Industry. Storage: Keep container tightly closed. Keep container in a cool, well-ventilated area. Waste Disposal: Waste must be disposed of in accordance with federal, state and local environmental control regulations. Looking for Anti Inflammatory Drugs API ?